DVD Decrypter is a free DVD ripping and imaging application which was developed by Lightning UK. This application was designed to get decrypt DVD encryptions and remove region codes. This application was last updated in March 2005. Although this software is no longer updated, you can still find it online through mirror sites. But one problem is, if your computer runs Mac OS X 10.9 (Mavericks), then you need to get the alternative of DVD Decrypter for Mavericks. Aimersoft DVD Ripper for Mac is actually an excellent alternative of DVD Decrypter for Mavericks that can remove the encryptions and burn the files to a new DVD. It is the best DVD ripper for Mac OS X 10.9 (Mavericks). Unlike the DVD Decrypter, this software can rip any DVD to a variety of formats depending on the formant you want. 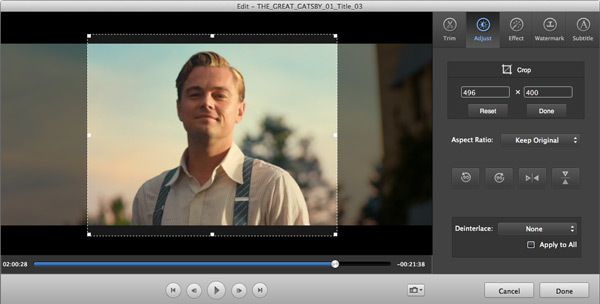 Another advantage that Aimersoft DVD Ripper for Mac has is that it comes with a built-in video editor that lets you customize any files in DVD disc. This is a feature that you cannot get from using DVD Decrypter. 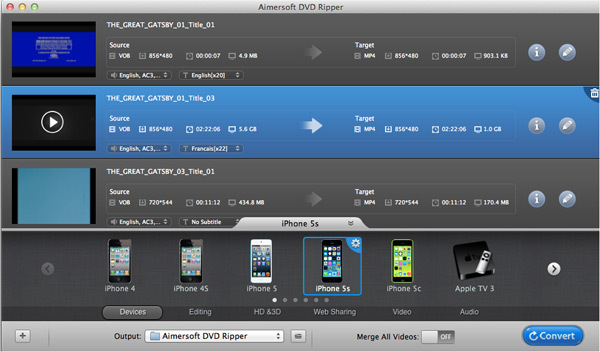 Aimersoft DVD Ripper for Mac also supports all portable devices as Mobile Phones, Zune, PSP, Xbox360, iPod, iPhone, Creative Zen, iRiver and more. It is easy to Rip DVD using the alternative of DVD Decrypter - Aimersoft DVD Ripper for Mac. Below are some step by step guidelines on how to operate it. Insert the Movie DVD in DVD Drive. Run DVD Ripper for Mavericks and then click on the DVD icon in order to initiate DVD loading. After running the software, all the chapters will be loaded from DVD in the panel. You can then click on Edit icon-->Show Chapters to see all the DVD chapters. Select the all the chapters that you want to rip. If you want to rip the whole DVD, you just click on the Edit icon -->Select All. After doing all the above steps, you can then go to "Profile" drop down box select the output format in. Popular file format like MP4, MOV, M4V, FLV and optimized presets for games consoles and mobile devices are all provided. Just choose the one you like. Before starting ripping DVD files on Mavericks, you can select the output folder, which is an optional step. This is the folder where you want to save the ripped files. When you are done, click on the Start button to begin the ripping process. As the ripping continues, you can see the progress in real time. Handbrake 0.9.4 for Mac is a freeware, actually it is not sold. The software is capable of ripping TV shows and movies from DVDs in order to be watched on Mac. The software comes with a tone of in-built settings for Apple TV, PSP, iPhone, iPod and PS3. It is easy to use; even those users who are not internet savvy can convert DVDs with just a single click. The only question is, it didn’t support Mac OS X 10.9 Mavericks or 10.8 Mountain Lion. If you are looking for Handbrake for Mavericks alternative, Aimersoft DVD Ripper for Mac (OS X Mavericks) is highly recommended. 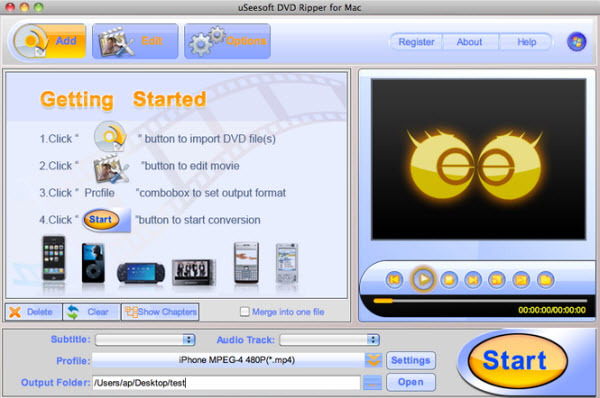 uSeesoft DVD Ripper for Mac is a software that can rip DVD video to any video formats such as MP4, MOV, M4V, MKV, , MPEG, AVI,3GP and MPGFLV. It is capable of extracting audio DVD to any audio files such as MP3, AC3, MKA, M4A and AAC. The software can also support many portable players like PSP, Zune, iPod, iPhone and mobile phone. It comes with many editing setting such as crop, trim and adds effect. The software has easy interface, higher conversion speed and excellent quality.